This filly is closely related to 17-time winner and champion Singapore galloper BETTER THAN EVER! She is bred to run all of the 2400m of the Oaks as a 3yo and she has the pedigree to train on at 4 and challenge some of the top staying races on offer. Purchased for just $50,000 our Bloodstock manager Peter Moody couldn't believe the value on offer for this filly! 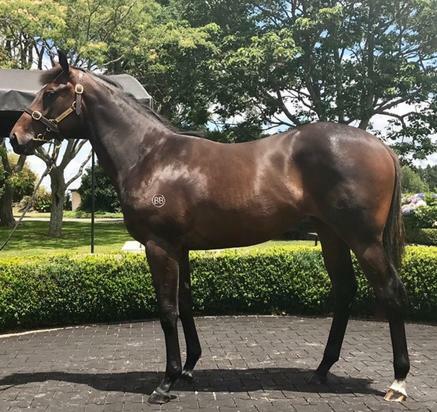 NZ Premier 2017 - Lot 388 Tavistock x Savasong Filly - LINDSAY PARK from Dalziel Racing on Vimeo. NZ 2017 Lot 388 in Ring from Dalziel Racing on Vimeo. TAVISTOCK (NZ) (Bay 2005-Stud 2010). 6 wins-1 at 2, Waikato Draught Sprint, Gr.1. Champion Sire in Hong Kong in 2015-16. Sire of 140 rnrs, 87 wnrs, 10 SW, inc. Tarzino (Victoria Derby, Gr.1), Volkstok'n'barrell, Werther, Tavago, Hasselhoof, Avisto, Nymph Monte, Longchamp, Tavy, Titanium, SP Harlow Gold, Downton Abbey, Fire Jet, Diamond Valores - Vadarian Bullet (H.K. ), Imperial Lass, Stylish Attack, Bullish Stock, Infantry, etc. SAVASONG, by Savabeel. 2 wins at 2050m, 2100m, ARC Coca-Cola H., 2d Taranaki RC New Zealand Bloodstock Insurance Oaks Prelude, 4th Hawkes Bay Lowland S., Gr.3. Half-sister to BETTER THAN EVER, Boys Will be Boys, Jellicles (dam of FELINES). This is her second foal. Her first foal is a 2YO. Boys Will be Boys (Hussonet). 2 wins-1 at 2-at 1300m, 1400m, A$86,480, R83,760 in Aust. and South Africa, AJC Lawler Financial Services 2YO H., 2d VRC Fashion S., L, AJC UD Trucks H., City Tatt's RC Better Bet With a Bookie H.
FELINES (Conatus). 8 wins-2 at 2-at 1000m, 1100m, A$368,205, to 2016-17, NSW Tatt's RC Concorde S., Gr.3, ATC Pro-Ride H., Swim Between the Flags H., McGrath Estate Agents H., Ranvet H., 2d ATC Ibis Milano Restaurant 2YO H., TAB Early Quaddie 2YO H., Tab.com.au H., 3d Scone RC Denise's Joy S., L, ATC TAB Place Multi H.-twice, Sydney Markets Foundation H., 4th BRC Lightning H., L.
Domesticated. Winner at 1500m in 2016-17, MRC (Mornington) Main Street P., 2d MRC Hyland Race Colours P.
Savasong. 2 wins. See above. Om. 4 wins at 1400m, 1600m, S$300,484, Singapore TC Gingerbread Man H., Jolie's Shinju S., Benchmark 67 H., 2d Singapore TC Brisbane Racing Club S., Hello Poland S., Trigger Express S., Initiation P., 3d Singapore TC Japan Racing Association Trophy, Gingerbread Man S., Panasonic Speed S., Why Be Initiation P., Kranji C S., My Royal Captain S., Class 3 H.
Zaju. Winner at 1000m in Macau. NEVER CAN TELL (War Pass). 4 wins-2 at 2-at 1050m, 1100m, A$172,550, to 2015-16, ATC Canonbury S., L, Sydney Markets Sprint 2YO S.
HIPPOMENES (Leo Castelli). 7 wins-2 at 2-to 6½f, Churchill Downs Kentucky Breeders' Cup S., L, Allowance, 2d Laurel Primer S., L, 4th Monmouth Sapling S., Gr.2. BE POSITIVE (Anabaa). 4 wins to 1400m, A$180,440, VRC National Jockey Celebration Day Victoria P., Gr.3, 2d MRC Mannerism S., Gr.3, Aare H., 3d AJC Sporting Chance Cancer Foundation Golfers 2YO H. Producer.